The Arrupe Jesuit Robotics Club, a.k.a. the RoboGenerals, participate in the FIRST Tech Challenge Robotics Competition. Our school competes against fifty other high school robotics teams in Colorado. Each year we build a new robot for the ever-changing competition game. 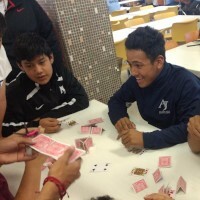 In addition, club members learn about engineering design, computer programming, and teamwork.